The conference will be held at IIASA, which is based in Schloss Laxenburg just south of Vienna. The Schloss was one of the three main residences of the imperial Habsburg family, and was enlarged to its present size by Empress Maria Theresa in the eighteenth century. Here the Habsburgs enjoyed relative freedom from the strict Spanish court etiquette at the Hofburg, but because only the Imperial rooms had heating facilities, the palace was used only in the warmer months. Since 1972 and thanks to the generosity of the Austrian Government, the Schloss Laxenburg has been the home of IIASA, bringing together researchers from across the world to find solutions to global and universal problems through applied systems analysis in order to improve human and social wellbeing and to protect the environment. Vienna is packed with imperial history; at the same time it has exciting contemporary museums, lively eating and nightlife scenes, and many quiet corners to explore (read more about Vienna). Participants are advised to make a timely reservation for a hotel room for their stay in Vienna. IBFRA18 has pre-reserved 250 rooms in Motel One at the central station from where the transport to the conference venue is organized. We recommed to reserve a room at this hotel or at other hotels close to the central station. Motel One rates are available for limited time only and reservations must be made by 27.08.2018. Bus transfers will be organized from the central station (Vienna-Hauptbahnhof 2) to the venue in Laxenburg every morning and will return every evening. Please note that the organized bus stop is not the same as the public bus stop (see map below). 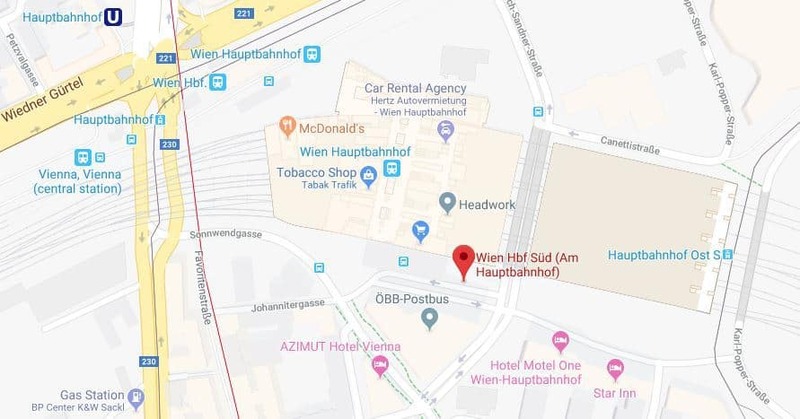 In Vienna take the red U1 subway line to Hauptbahnhof Station and then follow the bus signs to the exit Bus Terminal which is located on the left hand side adjacent to the main entrance of the train station. At the Bus Terminal (Stand N2) you can catch the #200 bus to Laxenburg (sometimes the bus destination may indicate Eisenstadt). The bus ticket costs €4.60 one way and departs roughly every 30 minutes. The trip takes 35 minutes. You should get off in at the stop called ‘Franz-Josefs-Platz’. Laxenburg is located 16km south of Vienna, Austria. You can reach us by driving along the southbound highway or “Autobahn” (A2). Leave A2 via exit Wr. Neudorf and then take a left at the first light. Follow the signs to Laxenburg. If you are driving to Laxenburg from the airport (on the A4) head towards Vienna/Graz. Take the exit Schwechat onto the motorway S1. After approx. 16km change from S1 onto A2 highway. Leave A2 at the exit Wr. Neudorf and then take a left at the first light. Follow the signs to Laxenburg. A taxi from either the Airport or Vienna to Laxenburg will cost about €40 in both cases. Note that holders of an EEA (All EU Member States, Iceland, Liechtenstein and Norway) or Swiss passport do not require a visa (the Schengen-treaty). Check whether you (do not) need a visa here. If you are required to carry a visa, please check the website of the Austrian embassy or consulate responsible for you (depending on your residence) to find out the details. You can find the Austrian representation responsible for you here. Please note that the issuance of a Schengen visa will ask you to provide information on where you are staying, travel dates etc. You will need information obtained from this document and your travel arrangements. You may be requested to provide a letter of invitation from the host venue to be able to obtain a Visa. Please be in touch with the organising committee, contact details will be made available upon confirmed registration. Please note that once the Visa invitation letter has been sent to you 1 week should be left before going to the Embassy and applying for the visa, to allow for all documents to go through. If you apply before this process is complete you may not be issued a visa. Visa applications can be lengthy so please allow enough time for the above procedures and get the process started early.